Oljanna Cunneen made a dress for Nancy Vogel in 1970. 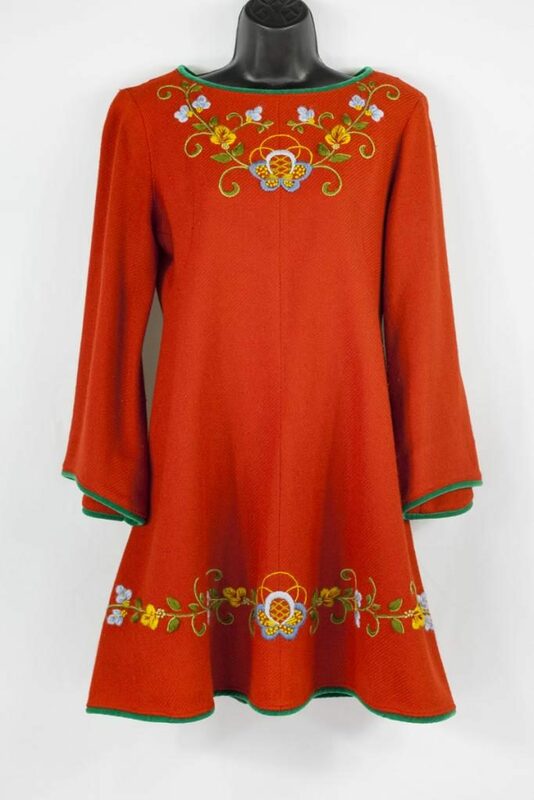 Catalogue records maintained by the Mount Horeb Area Historical Society describe the dress as a “Rust bonded wool A-line mini with wool crewel embroidery at the hemline and neckline. Multi colored rosemaled design and is piped in green velvet.” While accurate, that brief description fails to capture the significance of the rosemaled dress. That significance is the focus and aim of this paper. Through a study of the dress’s maker, Oljanna, and wearer, Nancy, this paper analyzes the dress in the context of 1960s Mount Horeb to reveal the forces and dynamics that gave meaning to the dress. Before studying its maker and wearer, it is useful to examine the object itself. The dress is A-line in shape. It is close-fitting on top, narrow at the waist, and widest at the hemline. Hemmed above the knee, the dress is “mini” in length. Long and loose sleeves that widen gradually from the shoulder to the cuff reach the middle of the skirt. Several sets of darts make for a fitted top. On the front of the dress, darts run from the side seam of the waist to the fullest part of the bust. A shorter set of darts start at the side seam under the arm, extend toward the center of the waistline, and intersect with the waist-bust dart just below the fullest part of the bust. On the back of the dress, a zipper runs from the neckline to the middle of the skirt. Darts on either side of the zipper move several inches up from the waistline. Together, the front and back darts form a tailored top that tapers from the bust to the waist. Starting at the narrowest part of the garment, the dress flares from waistline to the hem, creating a full skirt that resembles the letter “A.” Proportionally, the top (neckline to waistline) and skirt (waistline to hemline) are nearly equal in length. There is a visible texture to the rust colored bonded wool of which the dress is made. Although comprised of two layers of fabric, the soft looking textile is lighter and more free moving than expected. Green piping decorates the neck and hemlines as well as the sleeve cuffs. The most distinct feature of the dress is the multi-colored rosemaul design of crewel embroidery ornamenting the neck and hemlines. A five-petal flower situated above the fullest part of the bust is the focal point of the neckline crewelwork—a form of surface stitching using wool. From the blue, light blue, and yellow flower, a pattern of C-scroll stems, leaves, and smaller flowers extend along the neckline. The asymmetrical design creates a “V” as it reaches the shoulders. A similar but linear pattern parallels the hemline of the skirt. Again, the five-petal flower is central. From it, green and dark green steams spread out over the front of the skirt, reach across the side seams, and stretch several inches onto the back. Pairs of small light blue flowers add to the design. Slightly larger yellow and red flowers complete the rosemaul design. As previously mentioned, Oljanna made the dress in the 1960s, likely in the second half of the decade. Oljanna was a prominent member of the Blue Mounds and Mount Horeb area. Many have taken interest in her story over the years, both during her life and after her sudden death in 1988 at the age of 64. As early as 1962, Capitol Times ran an article on the hobbies and projects that kept the “farm wife” busy, such as rosemaling and embroidering. Subsequent articles in local papers chronicled her community involvement while scholars focused on her life as a storytelling and ethnic folk artist. Although many have documented various aspects of Oljanna’s life, none have studied the rosemaled dress she made for Nancy in depth. By exploring Oljanna’s life, this section examines the rosemaled dress from the perspective of its maker to show how it was a part of Oljanna’s mission to share her Norwegian heritage. In addition, this section considers the dress in relation to her large body of work to demonstrate that the dress is a creative expression of folk art. In 1983, Oljanna told a local reporter “it’s ‘terribly important’ for all cultures to keep in touch with their heritages. ‘What you are is where you come from.’” If Oljanna lived by a motto, it was that. She was where she came from. Oljanna was Norwegian, one the one hand. Her father, Henry Venden, was the son of Norwegian-born parents. Her mother, Gerharda Forshaum, emigrated from Norway in 1908. Like the other members of the large cohort of Norwegian-Americans in south central Wisconsin, Oljanna was also a Midwesterner, on the other hand. Born in Vermont, Wisconsin in 1923, she seldom strayed far from Dane County. Oljanna was where she came from. She was Old World and New. Her art reflects that. Oljanna had many talents. She “pulled from her parents’ combined repertoires of verbal and handwork traditions to become extraordinarily skilled in a spectrum of artistic expressions, from Norwegian-American joke and storytelling to sewing, embroidering, knitting, painting, and the creation of miniature troll figures that integrated all of these skills.” Oljanna constructed and expressed her Norwegian-American identity through the practice of those skills. She also drew on them to support herself and her family. After the failure of her first marriage, Oljanna wed Vernon “Jiggs” Cunneen. The couple lived on a 123-acre dairy farm near Blue Mounds where they started a family. By the 1960s, both Oljanna and Jiggs sought seasonal work to supplement their income. Oljanna sold tickets at Norway Basin Ski Area in the winter. Beginning in 1961, she worked as a tour guide at Little Norway during the summers. In addition, she “began painting and rosemaling for pay,” according to Janet Gilmore. Early jobs found her decorating farm signs and personal objects such as skis. Sometime in the mid-1960s, the Vogels commissioned Oljanna to decorate the exterior of their Norwegian gift store, Open House Imports. After that, she began selling “embroidery kits for tablecloths and small rosemaled pieces including Velkommen signs, plates, and children’s furniture” in Open House. Besides using her skills to earn money, Oljanna drew on her manifold abilities as she “engaged in self-promotion to her own benefit, which in turn benefited the community.” In 1966, Oljanna and her husband, along with Nancy’s husband, Lee Vogel, initiated a campaign to commemorate the area’s Norwegian heritage. These efforts yielded the Song of Norway Festival the following summer. During the month-long community celebration of Norwegian culture known as ‘Song Days,’ locals and tourists alike could explore rosemaling exhibits, purchase authentic goods from Norway, and sample Norwegian dishes. Weekend performances of the “Song of Norway”— an outdoor musical of the life of Norwegian composer Edvard Grieg —were the highlight of the festival. In addition to serving on its board of directors, Oljanna sewed costumes for all ninety “Song of Norway” cast members in the first years of production. At the same time, she became well known for her trolls, which she continues to be remembered for today. While Oljanna is less well known for her rosemaling, she was productive in that arena of folk art, as well. Rosemaling began as a form of peasant art in the 1700s. In “Rosemaling: The Art of Painting Roses,” George Bushnell describes rosemaling in Norway as a “rural, untutored art” initially practiced by men who relied on their imaginations to conceive of the “fanciful flowers, leaves, vines, scrolls, and embellishments.” Although the practice grew in popularity throughout the late eighteenth and early nineteenth centuries, it fell out of favor due to the rise of portrait and landscape painting in the mid-1800s. By the 1870s, rosemaling “had all but died out in the country of its origin.” As the practice declined in Norway, it took root elsewhere. Marion Nelson explains that, “During the forty-year period from 1836 to 1876, almost two hundred thousand Norwegians, most of them from isolated rural communities, left Norway and came to the United States where they settled primarily in the undeveloped prairie lands of Illinois, Wisconsin, Iowa, and Minnesota.” With the Norwegian immigrants came the practice of rosemaling to south central Wisconsin. Rosemaling was not widely practiced in the Midwest until the 1930s when increased interest in folk art facilitated its rise. In the wake of World War II, rosemaling declined in popularity until it experienced a revival in the 1960s due to growing interest in ethnicity. During that decade, rosemaling was practiced widely among Norwegian-Americans. As Nelson characterizes the 1960s upsurge in rosemaling, it was a “folk movement” because it retained “strains of earlier folk art activity” but gained “new impetus and breadth.” Oljanna belonged to that movement. She learned as a child how to rosemal from her mother. As an adult, she experimented with the practice. Instead of rosemaling in traditional colors, she often painted in shades of grey. She generally did, however, use more customary colors and maintain the traditional practice of rosemaling household items, as evidenced by her decorated cabinets and chairs. At the same time, she seemed willing to adorn anything if commissioned. Whatever her motivations or feelings about rosemaling, it is easy to see that this practice, as well as other forms of folk art, were a means through which Oljanna expressed and shared her heritage, whether it was for profit or not. Moreover, by expressing herself through folk art, Oljanna joined a community of Norwegian-Americans who shared her interest in a common ethnicity. In this way, the dress makes known the ways in which Oljanna identified as a member of an ethnic group. At the same time, this dress reveals how Oljanna stood apart from other rosemalers. When Oljanna rosemaled the dress, she adapted folk art to fashion in a way that was uniquely her own. Viewed in this framework, the dress reveals how creative traditional expressions of heritage can be. Distinct as she was, she was hardly the only creative person to rosemal. Images of objects held at the Wisconsin Historical Society included rosemaled non-traditional items such as a duck decoy and a bowling pin. Like the rosemaled mini dress, these material goods demonstrate how people merged tradition with modernity. While some practiced folk art creatively, few experimented with fashion in the way Oljanna did. The dress thus marks Oljanna as an original Norwegian-American ethnic folk artist. The dress’s maker and wearer had many things in common. Both Oljanna and Nancy were born and raised in south central Wisconsin. The women were both wives and mothers. They were each dedicated to and invested in sharing and promoting Mount Horeb’s Norwegian heritage. But unlike Oljanna, neither of Nancy Vogel’s parents emigrated from Norway. Moreover, neither Nancy’s mother nor father were born to Norwegian immigrants. In fact, it is not apparent that any part of Nancy’s family tree had roots in Norway. Unlike Oljanna, for whom the dress can be seen as expression of her Norwegian heritage, the object represents something different for its wearer. This section examines the rosemaled dress from Nancy’s perspective to understand what it might have signified for her. While this framework generates much speculation, assessing the dress in the context of 1960s women’s fashion provides a basis for the claim that Nancy used the dress to merge folk art with fashion. By comparing the dress to popular styles of the decade, the following shows how Nancy used the dress to identify as a member of the community and express her own sense of style. Nancy was born in Arena, Wisconsin in 1932. Her parents, Robert and Ethel (Allen) Hodgson had both been born in Wisconsin, as had their parents, Ralph and Elizabeth (Hamilton) Hodgson and Francis and Wilhelmina (Schuldt) Allen, respectively. Nancy married John Sievers in 1953. The couple had two sons together. By the age of 26, Nancy was a widow and single mother after John and the couple’s eldest son died in 1958. After several years of raising her younger son, George, on her own, Nancy met Lee Vogel. The couple wed in 1962 and took up residence in Mount Horeb soon after. In 1966, Nancy and Lee opened “a traditional Norwegian gift shop” in a Victorian-era house along Main Street. They named their store Open House Imports and dedicated themselves to its success. Open House, which developed into a family business, offered a wide range of goods. The store attracted passersby with “the blaze orange gingerbread out front.” Originally painted purple, the repainting of the gingerbread initiated “a long tenure [of] promoting tourism and Norwegian heritage.” That tenure included Nancy’s involvement in the establishment of the Mount Horeb Trollway. Viewed in this context, the dress can be seen as an extension of Nancy’s efforts to promote Open House. Without knowing more about what sparked Nancy’s interest in Norwegian culture, however, this is a shallow assessment. Beside her work at Open House, Nancy was active in the community. She was a charter member of the Sons of Norway Vennelag 513, she served as treasurer and chair of the advertising committee board of the Mount Horeb Area Chamber of Commerce, and performed in the “Song of Norway.” Regardless of the reason Nancy felt inclined to direct such a great deal of her time and energy toward a Norwegian heritage that was not her own, she clearly desired to be a part of the community. Considering her involvement, it is easy to imagine that she valued the community of Mount Horeb, the people of it, and her place within it. Within that context, the dress can be seen as one effort among many Nancy made to belong. As a non-Norwegian among people of Norwegian descent, the dress might have marked Nancy as a member of the community. While the rosemaled mini dress is clearly A-line in shape, it is important to consider the extent to which it mirrored patterns of production as well as dominant notions of gender in the 1960s. Since the dress was made, rather than mass produced, it falls outside of the ready-to-wear category. But the fact that people replicated the A-line shape shows the extent to which the simple design became synonymous with style. Conversely, the made aspect of the rosemaled dress might also be interpreted as a rejection of non-durable consumer goods. Nancy surly could have asked Oljanna to embroider a bought dress. The fact that Nancy commissioned Oljanna to make and embroidered the dress suggests that Nancy preferred it that way, maybe because she trusted Oljanna’s dress would be well-made. In relation to the new feminine ideal embodied by the 1960s A-line mini, the rosemaled dress is split. By 1962, Nancy was a 30-year-old mother and wife. In those ways, she and her A-line dress were counter to the Single Girl ideal. As a working woman, however, Nancy fit squarely within the model. Seeing the rosemaled dress and its wearer as neither wholly aligned nor entirely separate from the 1960s notion of femininity shows how pliable the category can be. A close study of the rosemaled mini dress suggests what it might have represented for its maker and wearer. For Oljanna, the dress was a form of folk art, a practice through which the Norwegian-American expressed her identity. For Nancy, the dress was a path to belonging in Mount Horeb. While the meaning of the dress differed among maker and wearer, it represents not only a part of Oljanna and Nancy—their sense of self and desires—but also a time and place. The rosemaul dress thus shows how an object can help us understand individuals as well as society as both navigate the ways in which they engage tradition over time. Wisconsin Historical Society. Wisconsin Architecture and History Inventory. P.G. Krogh House. Mount Horeb, Dane County, Wisconsin, 71295. http://www.wisconsinhistory.org/Content.aspx?dsNav=Ny:True,Ro:0,N:42949638284294963814&dsNavOnly=N:1133&dsRecordDetails=R:HI71295&dsDimensionSearch=D:308,Dxm:All,Dxp:3,N:694&dsCompoundDimensionSearch=N:694,D:308,Dxm:All,Dxp:3. Accessed October 26, 2016. Blanco F., José, Patricia Kay Hunt-Hurst, Heather Vaughan Lee, and Mary Doering, eds. Clothing and Fashion: American Fashion from Head to Toe. Santa Barbara, CA: ABC-CLIO, 2016. Bushnell, George. “Rosemaling: The Art of Painting Roses.” Wisconsin Trails (Autumn, 1969): 12–15. Gilmore, Janet C. “Mount Horeb’s Oljanna Venden Cunneen, A Norwegian–American Rosemaler ‘on the Edge.’” ARV: Nordic Yearbook of Folklore 65 (2009): 25–47. http://www.kgaa.nu/upload/tidskrifter/6_2009.pdf#page=25. Accessed October 26, 2016. Kelly, Rebecca J. “American Fashion Design.” In Clothing and Fashion: American Fashion from Head to Toe, edited by José Blanco F., Patricia Kay Hunt-Hurst, Heather Vaughan Lee, and Mary Doering. Santa Barbara, CA: ABC-CLIO, 2016. Leary, James P. So Ole Says to Lena: Folk Humor of the Upper Midwest. Madison: University of Wisconsin Press, 2001. Nelson, Marion J. “The Material Culture and Folk Arts of the Norwegians in America.” In Perspectives on American Folk Art, edited by Ian M.G. Quimby and Scott T. Swank, 79–133. New York: Norton, 1980. Riello, Giorgio. “The Object of Fashion: Methodological Approaches to the History of Fashion.” Journal of Aesthetics & Culture 3 (2011): 1–9. Radner, Hilary. “On the Move: Fashion Photography and the Single Girl in the 1960s.” In Fashion Cultures: Theories, Explorations, and Analysis, edited by Stella Bruzzi and Pamela Church Gibson, 128–142. New York: Routledge, 2000. Welters, Linda. “The Natural Look: American Style in the 1970s.” Fashion Theory 12, no. 4 (2008): 489–510. Creators, Collectors & Communities by by Bree Ann Romero is licensed under a Creative Commons Attribution 4.0 International License, except where otherwise noted.